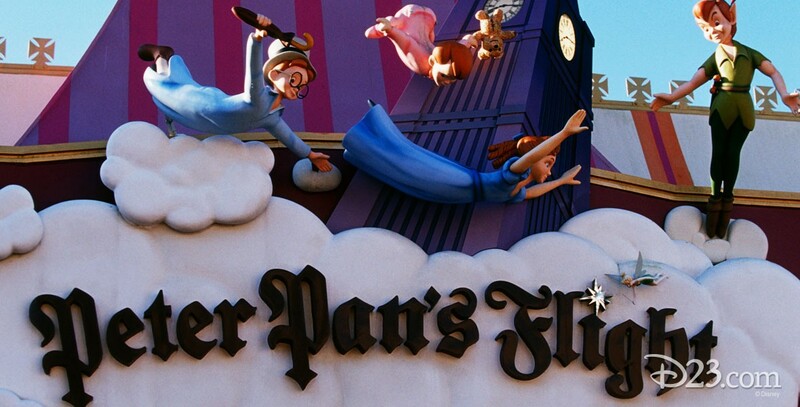 Peter Pan’s Flight Fantasyland attraction at Disneyland; opened on July 17, 1955, and redesigned in 1983. Also Fantasyland attraction in Magic Kingdom Park at Walt Disney World, opened October 3, 1971, and at Tokyo Disneyland, opened April 15, 1983. Also in Fantasyland at Disneyland Paris, opened April 12, 1992. Based on Disney’s 1953 film. The attraction is different because the vehicles are suspended from an overhead rail, giving guests the feeling of flying through the evening skies over London and Never Land. Makes use of black light and fiber optics. A new version with a unique ride system premiered in Fantasyland at Shanghai Disneyland on June 16, 2016.